Who’da thunk that it would be a film that would get me back on here? Coincidentally, I’m currently reading ‘Swallows and Amazons’ to my youngest and we’re up to chapter 17, so I’m very much hoping that might kickstart my original thread back into action in the near future. But for now: Will contain spoilers a-plenty, if you’re worried about that. TL;DR: If you liked the original ‘Mary Poppins’, you should go and see this one. If you didn’t, I suggest you take a long hard look at yourself. I think, in general, my policy is not to review sequels – particularly not in close succession. I’m making an exception here because this is both so great and so different from ‘The Long Way…‘ that I have plenty of thoughts. It is a sequel, in that it picks up directly where the previous book leaves off; but it is also a perfectly formed stand-alone novel in its own right. Like all the best SciFi, ‘A Closed and Common Orbit’ uses exaggerated concepts to project and explore fundamental human experiences. The focus is much closer than that of its prequel, with alien species providing a background and mirror for the two central characters: a genetically modified human and an Artificial Intelligence. This is a beautiful fairytale, an original story which weaves traditional themes and motifs so seamlessly that it feels much older. Many of the references are to Polish culture, but they are very familiar to all European folklore. At the same time, its characters and sensibilities are unmistakably modern, and its structure is extremely readable. Like the best reworkings, it questions the assumptions which underlie its source material, while maintaining complete respect for those sources. This continues a suite of books given to me by Fred of Assume Benevolence, who is an excellent source of recommendations. The unlikely premise: ‘Musketeer Space’ is a (mostly) gender-swapped retelling of Dumas’ ‘The Three Musketeers’, set in space. The resulting book is as silly as it sounds, and also as clever. It’s a ridiculous romp through space in the company of a group of impetuous, glory-seeking adrenaline junkies – who somehow manage to be thoroughly endearing. I’ve been putting off reading this for a long time because I thought it was a Worthy book, probably about the destruction of our world. 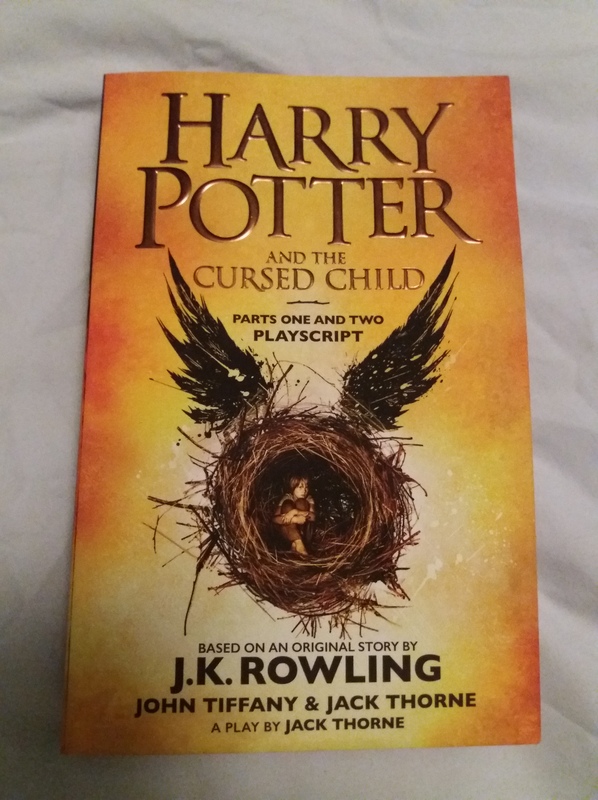 Fortunately, it was placed quite insistently in my hands on Christmas day, and I was prevented from missing out for any longer. ‘The Long Way to a Small, Angry Planet’ is beautiful and lovely. Essentially, it’s an exploration of what it might be like if everybody was nice and tried to understand each other. It’s like the Mangoverse in Space. This is the ultimate in fanfiction: written with the complete support and cooperation of the original author, who has done an outstanding job of engaging with her fan base. And as such, it is the very best of fanfic. It ties up some loose ends from the original series, speculates on complex characters’ motivation, develops and resolves some important relationships, and – most importantly – it made me cry, several times. This is a romp – I can think of no other word to describe it. I love ‘His Dark Materials’, and I think it needs to be made very clear that Count Karlstein is a completely different kind of book. It has none of the moral depth, the complex world-building or the deep philosophical underpinning. It was written for fun, and it is fun to read. I am quite the neophile. I like trying new things, and I confess that I am a bit prone to losing interest when the novelty wears off. I’m not terrible, or anything, but the tendency is there. Not a completer-finisher, by any means. I’m usually quite good at new things, too. I used to call it ‘beginner’s luck’, but now that I am old, I would like to own that picking up the basics of Stuff fairly quickly is one of my superpowers. Obviously prior experience and natural ability both play a role, but in general, compared with other people, my learning curve tends to be relatively steep at the beginning. This may be not be entirely unrelated to my experiencing new things as more fun. And off to one side of all that, my body is – well, a bit crap, really. I’m not what you would call disabled (unless you were being particularly generous), but I take Bad At Sport to whole new levels and there is some pain, somewhere, most of the time. So. Earlier this year I started a New Shiny kind of yoga, and it was very much fun because there was lots of Learning, and I was improving quickly in terms of what I could do, and I could see some differences in daily life, and being not-hurty, and there are some bits that I was ‘good at’ because I am Very Stretchy. And then there were a few weeks when I couldn’t go as regularly as I’d have liked, and I didn’t really practice at home either because I was Busy. The way this class works is that you do Things, and when you can do all those things, your teacher teaches you a New Thing to add on the end. And my teacher hasn’t deemed me worthy of a New Thing for weeks and weeks and weeks, and I realised that I had come to see the New Things as a reward and a reinforcement – quite apart from the fact that I can see perfectly well for myself that I’m not getting any better at the Things. And of course, I would not say to my teacher “I’m sad because you’re not giving me New Things to do” because I am all chill and yogic, man… But I did mention that I was frustrated that I didn’t seem to be making any progress. And that is HARD. Because I have always measured life in progress, as well as in praise (I think I’ve mentioned inner Hermione…), and the idea that anything is not about making progress is a bit alien, if I’m honest. But there we have it. It’s not about making progress. Maybe. I once read an article which suggested that rather than trying to stop procrastinating, people could increase their efficiency by finding really efficient ways to procrastinate. If you really don’t want to clean your kitchen, find something you want to do even less, and then cleaning the kitchen will feel like a natural and appealing way to avoid it. I am henceforth applying the same principle to my neophilia. I will not give up the yoga class because I’m not making progress. Instead, my shiny new hobby shall be Not Making Progress. This whole, rambly, unusually introspective post does have relevance. The astute my observe that I haven’t posted anything here for nigh on three months, to the point where it was starting to get a bit daunting to come back to – and leaping straight in with a book review and no explanation felt a bit strange. To be fair to me, this was partly because I had a Life Event which I can’t post about because technically it happened in somebody else’s Life, and that had me a bit discombobulated for a while there. But also – this isn’t a new blog any more. My stats are not dramatically changing, and my small, perfectly formed audience is showing no signs of growth. But hey – that’s OK! It’s not about making progress. I am writing this for me, and my few loyal followers, and if anybody else shold stumble upon it and enjoy what they find, so much the better – but either way, it’s all good. I really enjoyed ‘The Miniaturist’. I remember thinking that there were definite indications that it was a First Novel, and I looked forward to seeing how the author would progress. 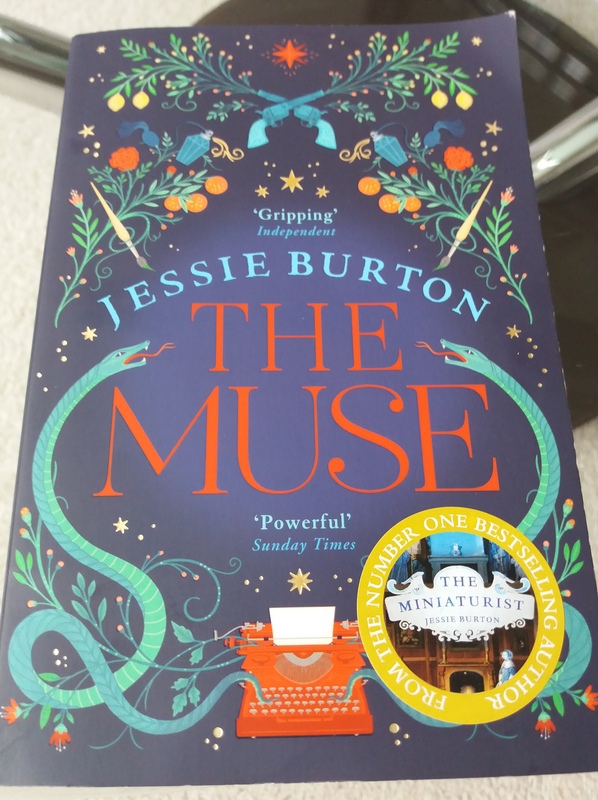 I really, really enjoyed ‘The Muse’. It has all the thoughtfulness and artistry and detail of ‘The Miniaturist’, but it reads a lot more smoothly. The characters are fascinating and delightful, and their relationships are both intriguing and completely believable. I’ve just got back from a rather exciting storytelling conference. It was tangentially work-relevant, but another exciting thing was that I had my first go at Free Writing. I’ve heard of this lots of times, but never got round to trying it. Essentially, the idea is that you write for at least 20 minutes without stopping or editing. It was fun, and I wrote a story. This version is slightly edited, but not much – I found I liked the unpolished language of the original. 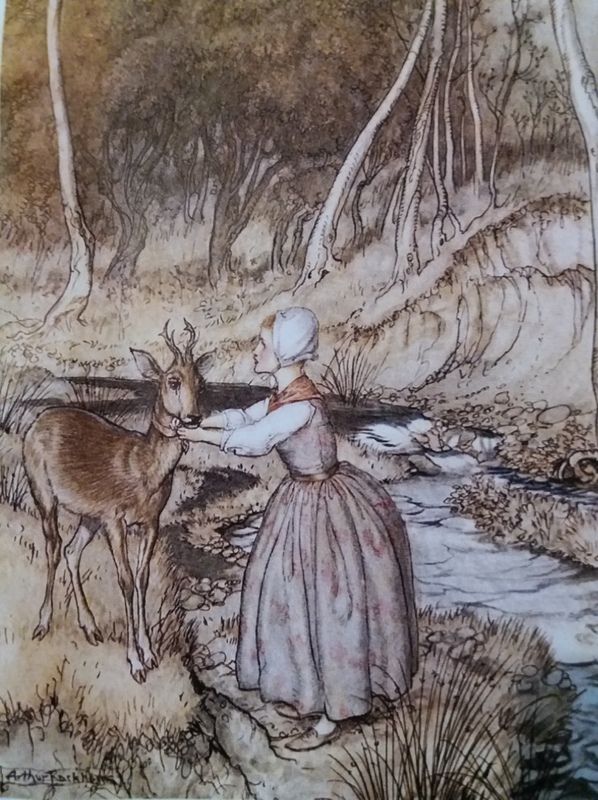 The girl was walking by the river when she came across a deer, a young doe walking along all by itself. The deer had a ribbon round its neck, so the girl thought, Who is this? She must belong to somebody. Maybe she is lost like me. The deer was lost by the river but the girl was lost in her heart. She went through her routines every day but she didn’t know who she was or what she was for.